Diet Success Strategies, by Alan Aronoff says that diets usually don’t work because most people don’t stay on them long enough to get results. When you rely solely on self-discipline to change your eating habits it is likely that it will be difficult to be successful over the long term. David Aronoff suggests a new approach, which involves the creation of a personal Diet Management System. The system is based on monthly, weekly, daily and hourly strategies to help you meet your health and weight loss goals. This book does not contain information on what to eat, recipes or weight loss secrets. Instead it provides you with diet success strategies that can help you stay on a diet. You are provided with 67 monthly, weekly, daily, and hourly strategies to help you achieve your short and long-term goals. Each strategy is can assist you when making decisions about food and lifestyle. They cover a range of factors such as diet, exercise, relationships, stress management, and mental attitude. An example of a monthly strategy might involve balancing your relationships with friends and family. Weekly strategies can include researching your food choices and creating your food list. A daily strategy might be to plan exactly what you are going to eat that day. When you practice these simple strategies regularly you will make better choices more frequently. This leads to the creation of new eating and lifestyle habits that promote weight loss and better health. Helps you figure out the balance between the foods you want to eat and the foods you think you should eat. Connects your food choices to your thoughts, feelings and emotions. Helps you make sense of conflicting dietary advice. Creates new habits of thinking that drive new permanent habits of eating. Helps you make more choices that produce the results you want rather than simply providing instant gratification. Because everyone has unique goals, challenges and eating behaviors you need to find the diet success strategies that work for you. You are encouraged to ignore the strategies that don’t fit with your lifestyle and focus on the ones that appeal to you. You are encouraged to create a balance in your approach to exercise so that it is effective as well as enjoyable. You can find more ways to be physically active in your general lifestyle so that you don’t have to spend hours in the gym. To help you stay committed to fitness you should focus on ways to make exercise fun and rewarding. 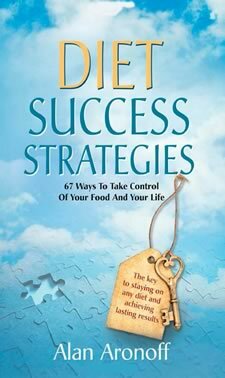 Diet Success Strategies: 67 Ways to Take Control of Your Food and Your Life retails at $14.95. Can be used in conjunction with any diet or weight loss plan. Focuses on making permanent diet and lifestyle changes. Breaks down large goals into smaller goals that are easier to achieve. Helps increase awareness about the long-term effects of daily food choices. Addresses the importance of psychological factors for successful weight loss. Is not a complete structured weight loss plan. Does not contain a meal plan, recipes or exercise guidelines. Necessary to refer to other sources for information on how to create a healthy weight loss diet. Diet Success Strategies acknowledges that most people have difficulty staying on a healthy diet. The purpose of this book is to help you find effective strategies to deal with the challenges of dieting. While this is not a complete diet or weight loss plan it can be used in conjunction with any program that you choose. By consistently making better lifestyle choices you will create permanent changes in your eating habits that will help you achieve your weight loss goals.